Fifty years on, Ballyholme Parish celebrated its significant Anniversary in style with the opening of a fantastic new Centre. Work on the centre began in February 2006, was completed in a number of months, and formally opened on Sunday 14 May 2006. 10% of all donations received for the building of the Centre were given to our link Diocese of Kajiado in Kenya, from where Bishop Jeremiah joined us to celebrate the opening. The Centre has been a resounding success for the Parish and everyone involved is delighted with the outcome. 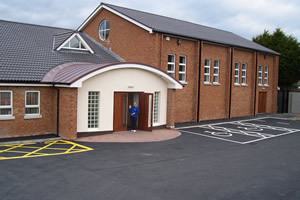 There is great demand for use of the new facilities both from within the Parish and from the local community. There is a great turn out for tea and coffee every Monday morning and lunches for on Fridays. Coffee and tea are also provided in the centre every morning after the 10am service. Come and join us! Want more info? / Need a lift?